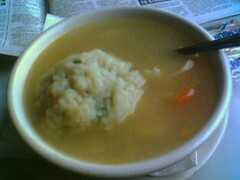 Chicken Soup with Matzoh Balls..Traditional!! Fill a small stock pot with water and add a bit of salt. While this comes to a boil add chicken necks and backs (if you like not wasting the chicken) or some chicken thighs, Once it comes to a boil, add 3 to 4 peeled and roughly chopped carrots, 2 turnips and 2 parssnips (also peeled and roughly chopped along with 2 ribs of celery. a large onion and few cloves of garlic. allow to simmer for at lest two hours (covered or not). I was rushing around to get ready and clean up the kitchen . I cleaned out all the shelves and bins in the fridge and as I put one back, I knocked into the Pyrex bowl than has my meat balls and tomato sauce. Oy. all over the fridge, the floor, broken glass etc. And try to keep the dog away from, it while I cleaned it all up. then I cut my finger on the glass. Of course if hubby had done his part cleaning the fridge, this would not have happened. We are having a skillet dinner with another package of ground turkey. I am so glad I bought lots of extra meat at Costco! Right after Shabbat, about 8:30pm we will clean and kosher the kitchen and put the Pesach stuff in the kitchen.. OY. Sunday will be CRAZY!